No sooner was the weekend over than the sun came out. It has been with us all week although there has been a chill wind in the morning and evening that has made the garden uncomfortable. During the middle of the day however, it has been wonderful. I have been wearing my faded hat all week and I have needed it to keep the sun from exploiting my baldness. I spent the morning on Wednesday in the shade of a giant conifer getting hot and sweaty clearing the ground. The I felled the conifer and let the light in, the difference is extraordinary. Unfortunately I let the heat in as well, and clearing up the assortment of ropes, saws and ladders that are inevitable in the process was the sweatiest part of the day. Things are a little more predictible down in the greenhouse where I grow a few dwarf bearded Iris. I have tried a few of the larger bearded Iris out in the garden but I have a shady garden in a wet county, it was never more than an idle whimsy. In the greenhouse I can grow a few of the smallest cultivars in pots, though I don't think they are very happy about it. 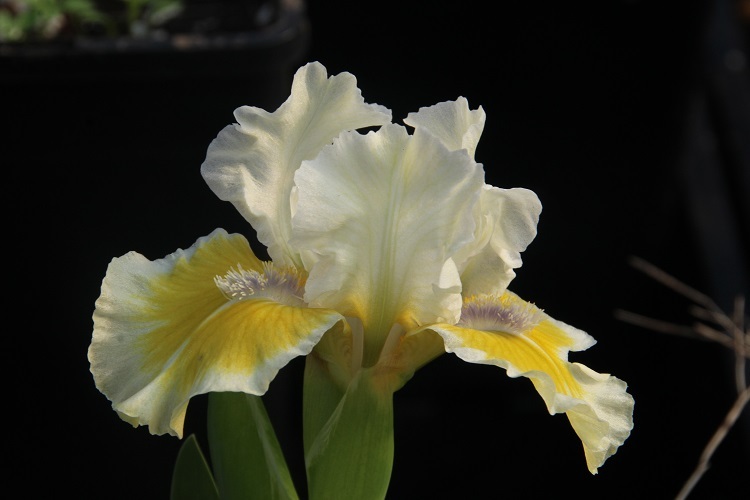 '.Captive Sun' has been the best, growing vigorously and flowering freely. I am aware that my small group of cultivars tolerates my conditions rather than frolics in delight in their pots so I enjoy them but I'm not going to add any more. For now they will remain on a bench that I save for anachronisms and ill-judged enthusiasm. 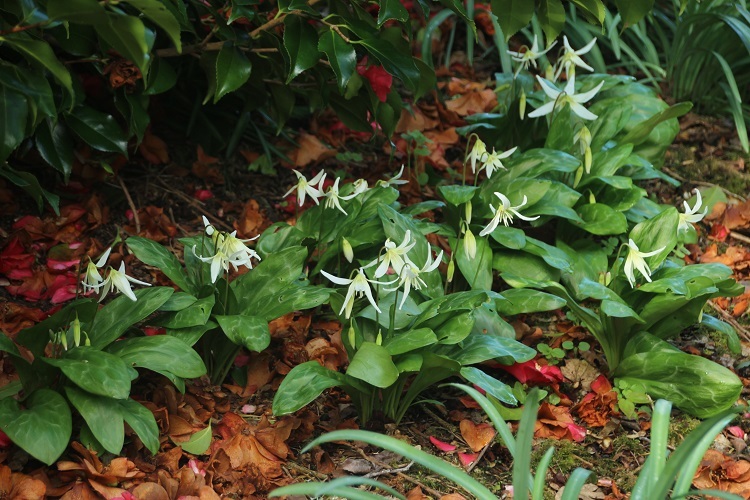 Erythronium are much more appropriate for this garden. I have an Erythronium bed where I indulge my obsession with collecting things. I like to think that the mixture of colours is given a sense of order by the elegant shape of the flowers but the reality is probably not that convincing. In the rest of the garden I grow 'Pagoda' and 'White Beauty'. When I bought the bulbs a couple of other things on the order were unavailable, so the thoughtful nursery added more 'White Beauty' to make up the deficiency. I was delighted, but I ended up with more bulbs than I knew what to do with. I planted them all over the place, wherever there seemed to be a suitable space. As a result I keep finding them poking up in unexpected places. I would like to say I had a happy time planting them but it was hot and there were a lot of them. However, I have had a happy time enjoying them ever since. This group grows under a Camellia that has expanded to shade them. As the flowers fall it mulches the Erythronium with scarlet petals which is disconcerting. Fortunately in the hot weather the fallen petals brown very quickly and my restful woodland planting remains calm. The Camellia are in line for a serious trim as soon as they finish flowering, next year the Erythronium will have more light and more moisture. I am hoping that the clumps will take the opportunity to merge together and increase before the Camellia re-assert their presence. Seen in the abstract, the loss of innocence always seems to be such a clear thing, a moment passes and the world is somehow different. That has not been my experience, and I have a meadow to prove it. When it was first designated (let's not pretend it was planted, it was allowed to happen) the meadow was in full sun all day. I had visions of lovely meadow perennials, the butterflies tripping merrily between the blooms. Slowly it became clear that perennial meadows were more a matter of promise than delivery. It is true that on occasion it has been pink with Geranium x oxonianum. They were removed, far too vigorous. Then it was pink again with campions but as the sheltering trees started to shade it. I finally accepted that I was never going to grow a dreamy meadow, and settled for a display of bulbs. The snowdrops are good, early and then late daffodils are good and finally the bluebells give a display. As their leaves die away I mow it back to a lawn and put it down to experience. However, innocence is not entirely trounced. 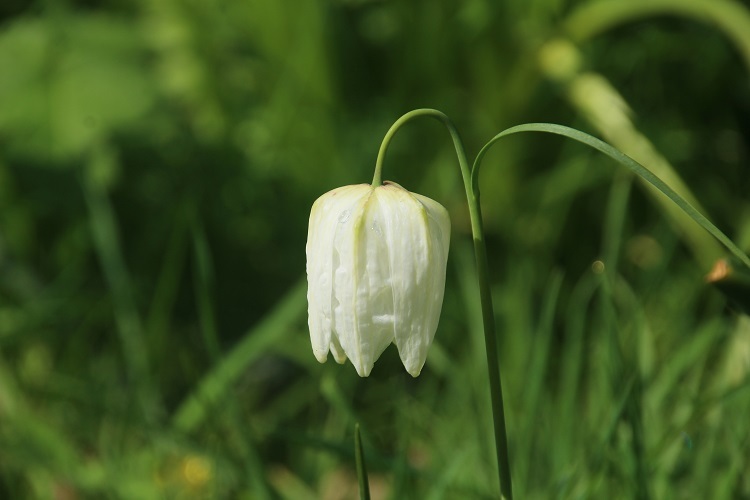 I planted some Fritillaria hoping the ground would be moist enough for them. Either they died or the rabbits ate them. I resolved not to plant any more but it seems I was hasty. Years after I wrote them off I still get occasional blooms growing through the grass. They are delightful, and I might have one last try to establish them in greater numbers in the hope that innocence isn't lost so much as misplaced temporarily. There was a butterfly up there as well this week, tripping merrily. I'm not alone in my optimism. The garden is full of things that aren't there any more. Ideas that looked good but turned out not to be. 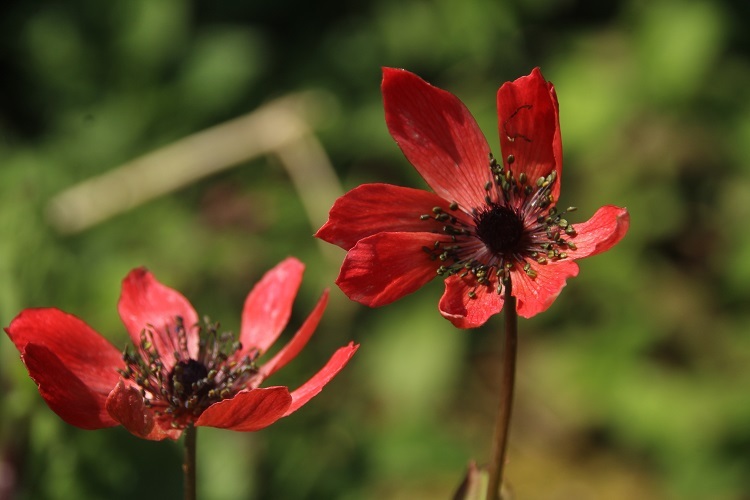 I was beguiled by the idea that Anemone pavonina might grow in the meadow, springing up before the grass got going and dying back in summer to rest in the dryness of their roots. It was a magnificent delusion, barely lasting the first season, and no subsequent sign of life has ever appeared. It is a pity, it would have been wonderful. I tried the same trick on the southern side of some trees where the sun could reach them and they wouldn't be wet. Another good idea that foundered on the rocks of reality. The only place that I can keep them alive is in a small patch of sunny ground kept clear of weeds for their benefit. I say their benefit, I mean its benefit. I only have one. I have one, it survives, it is a ravishing red. I could ask for more but since I don't have it, this will do nicely. It is an exciting moment when I notice the bud has appeared, another years unsuitable conditions survived. These are the shining times of spring as the last polished shreds on innocence are battered by the chilling wind. If I had known then what I know now, I wouldn't have planted them and I would have been less delighted as I walked past the untidy end of the herbaceous border.